At this time of year there are thousands of students from around the world arriving and settling in to a new and alien home as they begin their studies in the UK. They are often excited by their new environment, but they miss the familiar tastes of home. A few of them found their way to our home on Saturday night. As usual I had cooked generous quantities of rice. 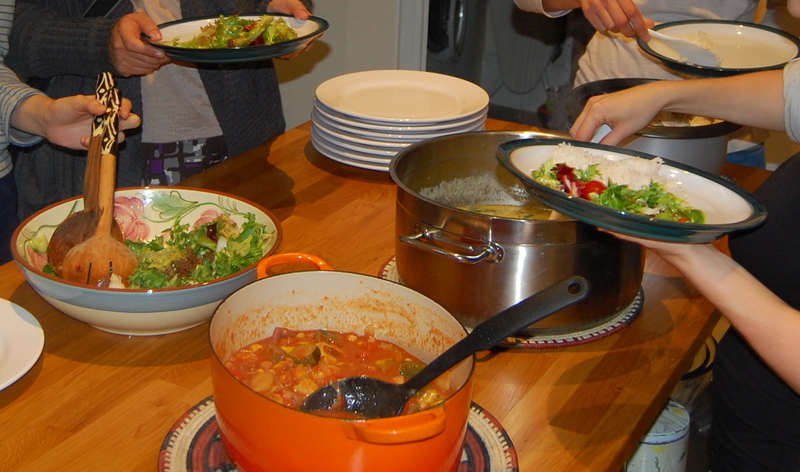 The spare rice cooker had come up from the cellar – along with the large catering pan – for our welcome supper for new arrivals. The food (Thai chicken, and a veggie alternative) was much appreciated but in fact even with 20 to feed there was plenty of rice to spare. By the end of the evening it looked somewhat unappealing, as it had congealed into glutinous lumps stuck to the bottom of the cooker. As I prepared to scrape the leftovers into plastic tubs I found myself wondering how long it would take for the two of us to get through it all, even if I froze a lot of it. I couldn’t really serve up such leftovers at our next mass dinner! However I decided to ask if any of our guests would like some rice to take home. Immediately a Japanese girl’s eyes lit up. ‘Really? Can I take some home?’ Soon three Japanese students were ladling generous amounts of cooked rice into clean plastic bags to take away with them, hardly able to believe their luck. Next time I have a lot of rice left over, I’ll know what to do.